When facilitating Project Based Learning (PBL) workshops across the country I often have math teachers eagerly ask for additional math PBL resources. They want material that might provide a further idea, a scaffolding lesson, footprint, or even an entire plan for a PBL unit. In meeting these teachers’ needs I have spent hours in research. 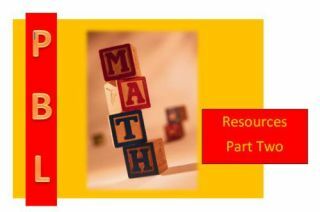 I am pleased to share with you these twenty-two sites that I am certain can help facilitate Math PBL. Of course I have many things I would like to discuss in regards to Math and PBL… but I will save that for a future post. I hope you enjoy these twenty-two resources that are a part of this four part series. Is there something that should be added? Let me know! Please return, share, and provide a retweet. Next Post… Part Three, as we continue our PBL Math journey. Sign up now!